Note from Dave: Ever since I started using Doug Stark's approach to grammar and mechanics instruction, I've been encouraging him to share it with the wider world. I first became a believer when I saw the results: when I taught kids after they'd had Doug, there was a noticeable difference in their mastery of the English language. As Doug explains below, we had a neat opportunity to measure the difference Doug's approach made, and the standardized test results were pretty incredible — even though, as Doug affirms, test prep is not what these warm-ups are about. To me, these warm-ups are the epitome of being as clear and impactful and purposefully repetitive  as we can be. Why would we teach grammar and mechanics this way? Because each of our secondary students deserves a shot at mastering the most fundamental conventions of the English language, and because the world will not graciously look past distractingly erroneous prose. With that said, I am so proud to introduce Doug's newly remastered warm-ups series, Mechanics Instruction that Sticks: Using Simple Warm-Ups to Improve Student Writing, which includes four levels of full year's worth of warm-ups (13 units per level) as well as quizzes for each unit and three supplemental activities). MITS is the first digital product I've published that wasn't my own, and I could not be prouder. I am so grateful and excited to introduce to you, Doug Stark. Below, please enjoy Doug's introduction to his books. English teachers are, in my humble opinion, the hardest working people in public education. We have the unenviable task of trying to convince a generation of kids raised on electronic devices and nursed by spell check to slow down and write with purpose and precision. We see ourselves as the last line of defense against the continual erosion of the language, and we try to teach our kids to avoid all of the dreaded errors – the run-on, the forgotten apostrophe, the misplaced modifier – that threaten to reduce our language into an incomprehensible stew of unpunctuated gibberish filled with text-friendly abbreviations and inscrutable emojis. We admire our content-teaching colleagues, but we secretly envy their ability to simply ignore the numerous errors that litter essay responses as they grade for ideas and content knowledge. We, on the other hand, are English teachers, so we can’t just ignore those minor grammatical errors. We have to figure out how to teach our kids the “rules” in a way that sticks and works for them as writers. Over the course of my career as an English teacher, I have wrestled with competing notions about how to help students write with clarity and a degree of correctness. I remember my first year of teaching and how I focused on free-writing and journaling, rarely taking the time to use direct instruction in relation to grammar or conventions. I also vividly remember having students switch into my class at semester; these students had been taught by an outstanding veteran teacher who had high expectations for student work. Needless to say, her kids were miles ahead of mine simply because she refused to accept work that did not reflect a student’s best effort. Entering my second year, I decided that my kids were going to get some top-notch grammar instruction. I planned out a start-of-the-year, six-week “boot camp” of sorts. I would teach these kids how to diagram sentences, and I would cover various common errors that they would be expected to identify and correct. I went through with my plan. At the end of the six weeks, my students could diagram sentences quite well. They could identify different types of clauses, and they could label parts of speech like nobody’s business. Unfortunately, during this six-week period, my kids didn’t do much authentic writing, so nothing I had taught actually stuck. As we wrote various compositions throughout the rest of the school year, I found myself reteaching virtually everything that I had covered so diligently at the start of the year. Thankfully, my school sent me to training to learn the “John Collins” approach to writing instruction and grading as a part of our school’s push to begin writing across the curriculum. At this training I learned all about focus correction areas. I was told that I didn’t need to mark every error on every piece of writing that I assigned. I could simply focus on three or four criteria, one of which would be a convention (i.e., no fragments, no run-ons, no errors in agreement, etc.). This training session was a revelation to me. I immediately became a much better writing instructor, primarily because my students were writing much, much more. Still, many students struggled due to the fact that they had very little background knowledge in relation to the conventions of language. Our school district’s philosophy, at the time, was very much anti-grammar or mechanics instruction. All instruction regarding correctness was supposed to take place within the context of student writing, which makes sense and is supported by research. However, in practice, very little instruction was actually taking place either within or outside of the context of student writing. As a result, I was getting a large number of freshmen students who knew very little about the actual language of grammar and correctness. For instance, when I would first introduce a mini-lesson on avoiding run-ons, I would start out by asking students to define “run-on.” The vast majority of students would define it as a “really long sentence.” I would then correct this misconception and explain to them that a run-on didn’t necessarily have to be a “really long sentence.” In fact, I told them, you could have a run-on if you incorrectly joined two independent clauses. This led me to define and explain what an independent clause was, which led me to define and explain what a subject and verb was. Basically, I had to work backwards to fill in all of the missing background information that was essential if my students were going to understand WHY an error was an error. And that was really the crux of the problem. The kids didn’t need to know how to label every single grammatical function within a sentence, but they did need enough knowledge so that they could explain the WHY behind any error that they might encounter. From this point on, I began experimenting with using “warm-ups” (also known as bell-ringers) as a way to teach students how to identify and edit common errors in their writing. The warm-ups were designed to focus on a particular concept and took about 10 to 15 minutes to complete. I would make sure that whatever area we were focusing on during warm-ups became the focus correction area for any and all writing assignments. As I continued using these warm-ups, I noticed that students were getting better at editing for errors; however, they were not necessarily experimenting with new sentence structures. When it came to sentence variety, my students were struggling, and I wasn’t quite sure how to get them to transfer the knowledge they were gaining from editing practice to their actual writing. Fortunately, at this time a colleague gave me a copy of Jeff Anderson’s book Mechanically Inclined. Anderson uses extensive modeling and visual aids to help students craft sentences. Most of the sentences he uses as models are either from works of literature or from student work. I decided to incorporate Anderson’s approach to sentence crafting within my warm-ups , and my students responded positively. They enjoyed drafting sentences and didn’t even mind reading them aloud. More specifically, I found that students were actually transferring many of these sentence structures over to their writing. I noticed students were starting to use the semicolon correctly. I saw fewer comma errors, especially after introductory elements. In general, my students were pushing themselves to become more sophisticated writers. Because I had put up posters with models of different sentence structures, I found it much easier to teach sentence variety. Often times, before students would begin writing, I would simply ask students to use and highlight a particular sentence structure. I felt like I had finally found a functional, logical way to teach students to use punctuation properly. The warm-ups will not work if you use them like worksheets. You can’t just hand them out and let the kids go. I try to think of each warm-up as an interactive lesson with multiple checks for understanding. Here are the steps I follow when using a typical warm-up. Step 3: After a minute I will start randomly calling on students to help me fill in the necessary background knowledge. I try to get through this process as quickly as possible. Sometimes I fill it in on my copy; sometimes we just go over it verbally. Step 4: I read through the directions for the application exercise (1-3 in this case) and get kids started. As kids work, I quickly circulate around the room, focusing on students who I know are struggling. In most cases, I circulate for no more than about 1-2 minutes. Step 5: After circulating, I read the following aloud: “Use a semicolon and a transition to join two independent clauses.” I then point to the different visual clues for the sentence structure. Finally, I read the model sentence and point out that the semicolon and the word “consequently” are used to connect two independent clauses. I then ask the students to construct their own sentences following that model. Step 6: After a minute or two, I read the directions for exercise #5. I remind the students to be prepared to explain why the other four examples won’t work. Step 7: As students finish, I say the following: “Turn to your elbow partner (or neighbor) and check numbers 4 and 5 together. Read your sentence construction aloud and have your partner initial next to the sentence if it makes sense and is punctuated properly. Then, discuss which answer is correct and explain why the other four are not correct.” While students check their answers, I circulate around the room, making sure they are on task and checking in with struggling students. Step 8: After a minute or two, we are ready to correct the warm-up. Most of the time I will have students correct their own warm-ups. Sometimes I will have them exchange papers. I ALWAYS have the students put some type of grade on the warm-up, and I ALWAYS collect the final product. How you choose to grade these warm-ups is totally up to you. Because I call on students randomly as we correct the warm-up, I rarely have any issues with students not finishing. I also make sure that kids understand that this is a timed assignment and will often place a stopwatch on top of my copy under the document camera, so they can see how long they have to work. Step 9: For the first three, I would simply call on a student randomly to tell me where he/she placed punctuation. If the student gets anything wrong, I will try to talk him/her through his/her mistake. Step 10: For the sentence construction, I call on three different students to read their sentences. I always have the students read the punctuation aloud so everyone in the class can hear where they placed it. This may seem weird at first, but it is extremely effective. For instance, I’d read the model sentence like this: “The evidence was overwhelming … semicolon… consequently … comma … the jury returned a verdict of guilty.” If a kid forgets to read the punctuation aloud, I make him/her repeat the sentence. If any part of the sentence does not make sense, I quickly explain what is wrong. I do not want to get into a prolonged discussion at this point, but I do want the student to understand why the sentence does not work. Step 11: Finally, for number five (see Figure 1), I would ask one student to identify the best response and to briefly explain why it was best. I would then go through the incorrect answers, asking random students to explain why each example was incorrect. Reading through those directions, this sounds like it takes a very long time. In truth, the entire process takes around 10-12 minutes. If that is longer than you want to spend, cut the warm-ups down. Split them up. Do whatever you need to do. Just don’t cut back or eliminate the process of checking for understanding. Give the kids time to share their answers with a partner. Make sure that you talk over the WHY behind the answers. My preference is to complete approximately three warm-ups a week (30-35 minutes of instructional time). Because my school is now on a semester schedule with 60 minute periods, I still have 45-50 minutes to initiate and complete a lesson on days when I use a warm-up. If I need the whole 60 minutes, I skip the warm-up on that particular day. In my opinion, the warm-ups help my students build a base of knowledge that they can apply to the writing process. When we’re writing, I am free to circulate through the room, conferencing with students, making note of other errors that students are making (this is where I focus on surface errors involving capitalization, word errors, or spellings that are not heavily discussed during warm-ups). I can refer back to concepts that we’ve learned and discussed, and I can quickly and efficiently adapt to the needs of my students during the writing process. Using warm-ups or any other type of worksheet will have zero effect on student achievement if it is not tied to extensive, repeated opportunities to write. I have always looked at these warm-ups as mini-lessons designed to improve the writing ability of my students, not as a replacement for authentic writing. Some of the activities on these warm-ups resemble the activities on the ACT or SAT tests, but that is more a function of my wanting to give kids a few examples to build some degree of familiarity. If you look at the warm-ups as a whole, you’ll see that they are not designed for “test prep.” They are designed to help students gain a stronger command of the conventions of the language. Feel free to adapt these warm-ups as you see fit. Look through the supplemental activities that I’ve included and see how they might fit within your classroom. I know that I am constantly tweaking every classroom process and activity to help my classroom function more efficiently and effectively. I have shared my warm-ups with many of my teacher friends, and I am always impressed with how they alter them to fit their instructional style. I have ordered the warm-ups based on the sequence that makes most sense to me. However, if you prefer, you could certainly choose to pull mini-units to teach as you see fit. I sincerely hope that this little handbook helps make your job a little bit easier. If I can be of further service, don’t hesitate to be in touch. 2. 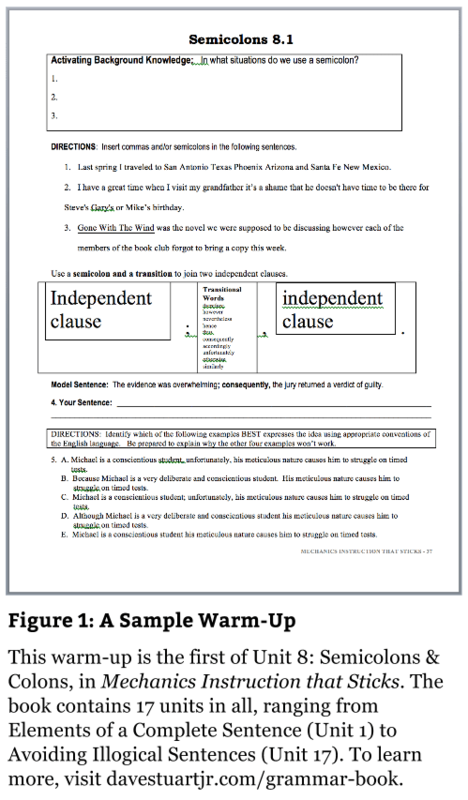 Anderson’s templates, sometimes with variation, are incorporated on nearly every warm-up (e.g., see Figure 1’s “Independent Clause; Transitional Words, independent clause” graphic). These are used with permission from the publisher. 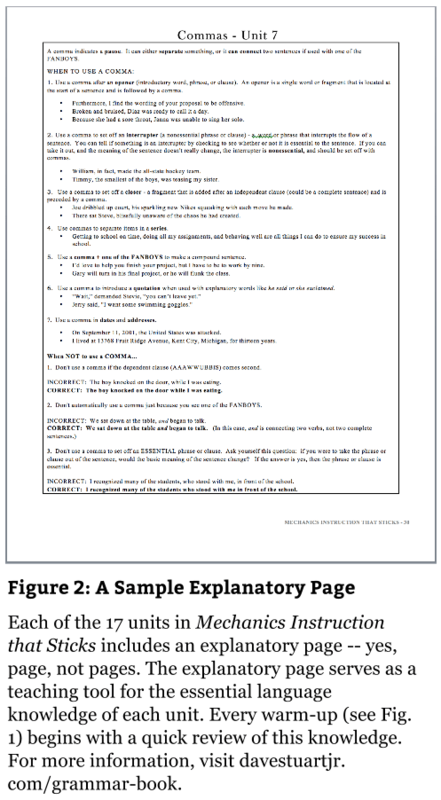 For a robust treatment of these sentence templates and Anderson’s approach to mechanics instruction, check out Mechanically Inclined: Building Grammar, Usage, and Style into Writer's Workshop. Would these warm-ups be appropriate for fifth grade students? Thanks! I think you could adapt some of the warm-ups to fifth grade, especially the units on basic sentence structure and punctuation rules. I would highly recommend that elementary teachers / middle school teachers purchase Jeff Anderson’s book. I love his approach, but Jeff’s work is intended to be used within the context of a writer’s workshop (geared to grades 5-8), so it doesn’t translate directly to most high school classrooms. I purchased MITS level B and have the screenshot of the license number but do not have a clue where to access what I purchased. I am very disappointed as there is nowhere to turn to find information. I’ve tried to contact Dave Stuart as well. I hope my school does not loose its money. Cheryl, I am so sorry to hear this. The product was delivered to you immediately upon purchase, via the receipt email. Please contact support@davestuartjr.com for quick support! Thank you for sharing your work. I just wanted to let you know that I noticed a mistake on the first page of the word document. You have written “should have went” instead of “should have gone”. Thank you, Anna! Problem fixed; the files within Gumroad are now updated. I don’t have an e-reader. Can I just download these to a computer? Yes, John! That is what I do; I prefer the bigger screen. Thanks for another great resource! I truly appreciate the content and ideas that you’re putting out for us at an affordable price! Thank you so much, TH. It’s important to me that these resources are affordable for an actual teacher. Quick question: I use the “a” parts (ex., 1.1.a) for warm-ups. . . what are the “b” parts (ex., 1.1.b) used for? Hi Paula! Doug created those as extension activities so that teachers can extend or “mix it up” as needed. I just purchased and noticed on exercise 1.1 questions 5 A and C have weather spelled incorrectly. Hi Pam! Doug sometimes includes random words errors in the sentence revision sections to touch on some word errors that hang some students up. With those sections of the warm-ups, you want the kids to be able to speak to word errors, if applicable, when they are discussing why a given sentence is one of the wrong answers. We appreciate you bringing this up, as I’m sure others will have similar questions! I was trying to purchase today, but the link is not working. Can you send the link or is it being repaired? These look amazing!! Hi, Dave. Can you explain the Academic Writing Handbook? Is this entire 17 Unit series of pages the handbook? Or is it something different? I’d like to use try this program with my students, but I’m a little lost on how to begin! Hi Holly, I just wondered that same thing! I may be wrong, but my interpretation was that the Unit introduction pages (ex. the page that says Clauses and Phrases – Unit 2) for each unit make up that handbook, so it would be 17 pages total to give the kids. My question to add to yours is whether it is best to go through those beforehand and, if so, how to do that. There are short fill in the blank pieces for each of those pages and I’m wondering how Doug goes through those. I’d love to print those pages for my kids. I’m really interested in this resource, but I teach 10th and 11th graders. Before I make the purchase I wonder what your thoughts are on using the warm-ups with these students. Thanks! Do these warm-ups come with answer sheet? Where are the answer sheets? At the end of the .pdf file — scroll all the way down! I was so encouraged by the information. I instituted Instructional Notebooks (INB) and “Bell work” three years ago and love how it all works together. Last year our school did a training with Dr. John Collins and my teaching of ELA has more purpose. I am glad to know I am on the right track and other professionals are seeing success with this format. Are these appropriate for tenth graders without needing to be adapted further? Thanks! Yes, Ron — Doug and I think these are ideal, as is, for grades 9-10. I bought your program and I am in Unit 2. I already feel insecure about not having an answer key to back up my work with my students. Although some teachers may not feel the need for this support, I want to make sure I am correct in my grammar work. Will you create an answer key for this program soon? I would really appreciate it. I have a brilliant group of honors 9th grade students who ask a lot of great questions but some I can’t quite answer. I just noticed that I have to download using Adobe in order to get the full program with the key! Thanks Dave! I’m so glad, Maryann — thank you for the update! Does the book have any assessments, or simply the practice? Angie, no assessments at this time — that’s a possibility for the second edition. Thank you for the question as it helps us know how to shape future iterations of the book! Do you have plans or have you updated since my original purchase a unit on the use of ellipse. 8th grade teachers would be grateful!!! Hi Terrie! Right now, no plans for the ellipse. I will let Doug know that’s of interest to folks; he’s at work on another edition! I have purchased this resource for use in 7th grade, and my colleague is interested in using it as well in 8th grade. Do you have a suggestion for this, or have you developed a resource to use before or after this program? Hi Anna! First of all, Doug and I are excited that you have this question because Doug has started work on another set of warm-ups. For the time being, you might have your colleague modify some of the sentence corrections portions of the warm-ups — that could serve as good review for your students. However, next year, we should have more than just one warm-ups book. Thank you for asking, Anna! I’m so glad to hear this! Thanks! Hi Dave, and Doug- I purchased the book and hope I can make it work for my 6th graders! What do you think? Amy, I think it’s doable. Stay tuned for some updates Doug is working on for the beginning of August — they should help make this even more possible! Sounds good – thanks, Dave! and Doug! This is a great resource. I used it last year (2015-2016) with both freshmen and seniors. I just need to get it more into the routine, but the students said that they learned more with me (in regards to grammar) then any other class. [sad for the seniors!] If you haven’t read Jeff Anderson’s book, you really should. It does help to understand these even more. I was trying to create something similar after my first reading of Mechanically Inclined. Fortunately, I stumbled upon these. I really appreciate your work and will definitely look for future products! Thank you Doug and Dave for sharing! Your approach makes so much sense! Has there been any conversation about creating classroom summative assessments for students to demonstrate proficiency? Stay tuned, Peg! Doug MAY be working on something like that for NEXT school year. Ok, thanks! Wouldn’t it be cool if the classroom-level summative assessments could be SAT-like? Then I think more students would get the connections between the warm-ups, their writing, and standardized testing. Thank you again for giving teachers a great tool! I just started using the program and I’m wondering if there is a way to use less paper. I like it, but it seems like a lot of copying. Any ideas? Doug and I have heard of teachers using the warm-ups digitally, and once in awhile we experiment with putting one warm-up on the projector and having kids do the work on their own sheet of paper. We find that that works well for some of the exercises (e.g., sentence creation) but less well for others (e.g., sentence corrections). Hi I selected “click here” to purchase grade 7-9 ebook for $10.00. The pull down menu it says “book level loading” and won’t let me purchase. Not sure what I’m doing wrong. Help? Thanks! Hmm, Amy — try accessing it on another device, maybe. That problem is a new one for us! Hi! When you encourage “adapting” to your needs, do you mean the pages are editable? Thank you! Oh – I found a Q&A that answered my question! The only edit I want to make is the font for a 504 – not any of the content. However, I went to buy and clicked on, “To buy Doug’s year’s worth of warm-ups for $10, click here” on this page, but when I clicked, the price was $15 instead of $10. Will you honor the $10 price? Thank you for answering my question so quickly, and on a Sunday! $5 for 50 pages is, indeed, quite a bargin. I was looking at Level A as I teach 7th grade. Is that one still $10 then? Because it looks like it’s $15 when I click through. I would love a coupon if the price is $15. Thanks for your generosity! Is the book an electronic PDF file that will be emailed to me upon purchase? It comes in both PDF and .doc formats. When you purchase, you are given a link to a page where you’ll be able to download and view the files indefinitely. I hope that helps, US! I am teaching 8th grade General ELA. Should I choose the one geared for 6-8? I have loved using MITS with my 9th graders, and now my whole department will be using them next year! My question is in regards to technology: Any chance the handbook will be published in Google Docs format? Hi Natalie! That would be amazing, but right now, no plans for it. The difficulty is that Doug has so much intense formatting going on in Microsoft Word for these warm-ups pages that it really doesn’t transfer into Google Docs. I don’t know anyone who formats things as intensely in Word as Doug. The good side of that is that the warm-ups do a lot on a single page; the bad side is that, when you want to edit them or make them techno-friendly, they are really finnicky. If you can think of any solutions, let me know! Hi Dave! Our standards for verbs extend to mood. Would there be any plans to supplement these to further align with CCSS? Thanks! I purchased the Level B book a while back, but quiz material was not included. How do I get just the quiz info at this point? I love this material and use it with both 9th and 10th grade classes. Where can I purchase these? The Gumroad site says they are no longer available. Can you recommend anything similary for grades 3-5? I purchased this program when it VERY first came out. It’s great but can I get the remastered version with quizzes? I purchased all three books for this program,but I cannot access it via my email. Is there another way I can access the PDFs? I would like to begin using this with my 8th graders on Monday. Hi Devon! I’m so glad you reached out to us here and at support@davestuartjr.com. I hope my reply was helpful. If you’re still having access issues, just email us and I’ll get right on it. We want you to have what you need!